Before business on Mars started booming, the first pioneers from Earth had just one objective: survive. Play through over a dozen challenging scenarios and overcome the struggles of settling on Mars by aiding the growing colonies and ensuring their healthy futures. In this DLC, the stock market and other business owners aren't your enemies - instead, you're fighting against Mars itself. 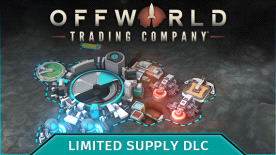 Limited Supply takes a core rule of Offworld Trading Company - buy whatever you want, whenever you want it (as long as you have the cash) - and turns it on its head. Each scenario has a different ruleset and restricts what resources you're allowed to buy and sell, meaning that you'll have to constantly reevaluate how to thrive in each new location if you want to survive. In normal games, you need to build up your business and turn a profit in order to buy out your competition. Now, you'll need to meet a list of objectives set by the colony in order to win and proceed to the next scenario. As you progress, the tech you'll have access to becomes more advanced - but, so do the colony's requests!